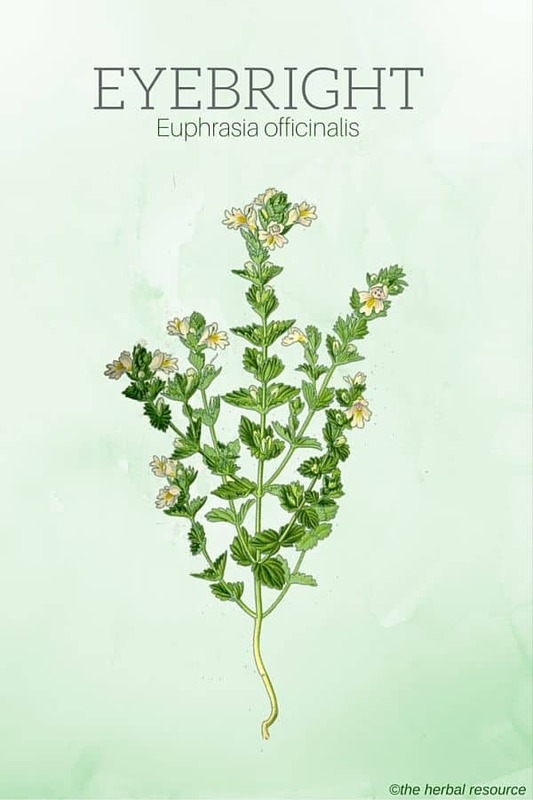 The generic name Euphrasia means “well-being” and refers to the healing properties attributed to these plants. Other Common Names: Meadow eyebright, red eyebright, euphrasia, ögontröst (Swedish), Augentrostkraut (German), eufrasia (Spanish), casse-lunettes (French), augnfró (Icelandic). Habitat: Plants belonging to the genus Euphrasia are found in all parts of the world and include ca. 450 species. Euphrasia officinalis is native to Europe but has been introduced to Asia and North America. Description: Eyebright is an annual plant reaching from 5 to 15 cm in height. It is parasitic or semi-parasitic. It attaches itself to the roots of other plants and obtains much of its nutrition through these host plants. The stems are square and branched and the green serrated leaves are arranged in pairs. The plant is in bloom from July to September. It produces small flowers in spikes from the upper leaves. The flowers are white and purple and covered with spots and stripes. Plant Parts Used: It is the above-ground parts of the plant that are used as herbal medicine. The plant is collected when it is in full bloom and the dried for late use. 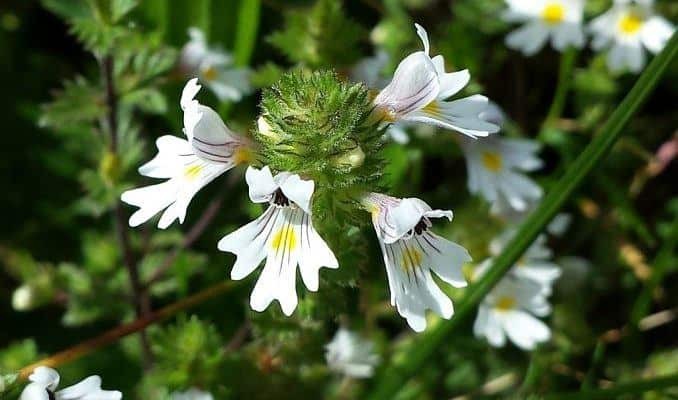 The drying temperature must not exceed 35 ° C.
Eyebright contains carbohydrates, tannins, alkaloids, sterols, phenolic acids, iridoid glycosides (aucubin, loganin and verbenalin), flavonoids, amino acids, essential oils and vitamins A and C.
Ever since the Middle Ages, eyebright has been used to treat bloodshot and irritated eyes. It is believed that this application arose because of “signature doctrine”, a method dating from the time of Pedanius Dioscorides (40 – 90 AD) stating that any plant that resembles specific body part can be used to treat ailments afflicting it. In this case, the flowers of eyebright have stripes and dots, not unlike bloodshot eyes. 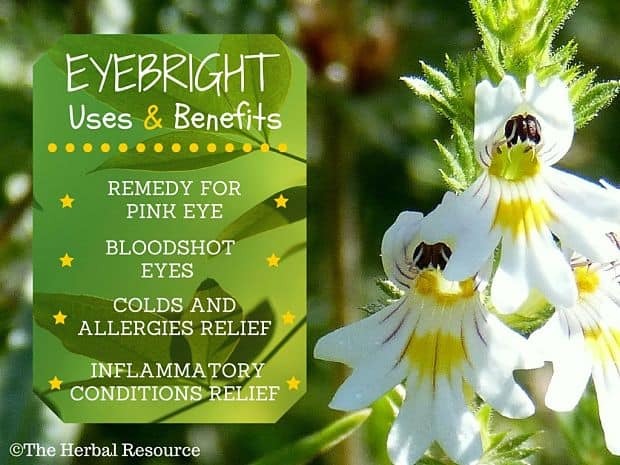 Eyebright has been associated with eye health for a very long time, and from the 11th century to our days, the herb has been used as an herbal remedy for various eye diseases. 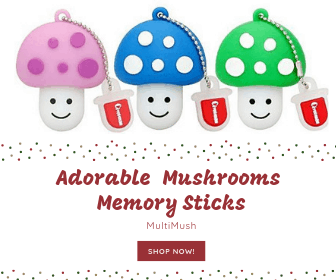 It has been used both internally and externally to soothe tired and bloodshot eyes, and to treat styes (an infection of the sebaceous glands at the base of the eyelashes), conjunctivitis and inflammation of the eyelid edges (blepharitis). Eyebright was also used traditionally to treat sore and itchy eyes caused by colds and allergies. An herbal tea made from the herb was considered a useful remedy for sinusitis, rhinitis, an irritation and inflammation of the mucous membrane inside the nose, and other respiratory infections. No one should practice self medication when it comes to eye diseases without first consulting a professional health care worker. Some eye infections can be so severe that they require immediate antibiotic treatment in order to avoid permanent damage. Very little scientific research is available when it comes to the health properties of eyebright. Even though the herb has been used for centuries as a remedy for conjunctivitis and bloodshot eyes, many herbalists believe it is not enough in order to recommend its use in modern herbal medicine. Their arguments for refraining from using eyebright is because no studies so far have been able to confirm any of the alleged medicinal effects of the herb. Thorough studies of the herb’s ingredients were not made until 1999 and then it was established that some of the ingredients found in the plant have anti-inflammatory, antibacterial and astringent properties. The substances aucubin, loganin, and verbenalin have been shown to have a positive effect on inflammation in laboratory animals. Aucubin stimulates the production of proteins that are involved in the healing processes, which may explain the use of eyebright as a healing herb. An herbal tea can be made for consumption, eye drops or compresses. A few teaspoons of the fresh or dried herb can be boiled for at least 10 minutes in 2 to 3 dl water, and then filtered through a coffee filter. Eyebright is sometimes used in commercial preparations, usually in combination with other herbs such as blueberries (Vaccinium myrtillus), that are also thought to be of benefit for the eyes. Not much has been written on the possible interactions or side effects of eyebright but it seems to be safe when taken internally and used in moderation as herbal tea. Compresses are also deemed safe when used properly on the eyes. The safety of the herb during pregnancy and lactation has not been assessed and in light of that, it should probably not be used. Mills. S. Y.:The Dictionary of Modern Herbalism. Healing Arts Press. 1985. Plants for a Future. Euphrasia officinalis.